Ready to install a website on Dreamhost with the one-click install feature but not sure which program is right for your plans? 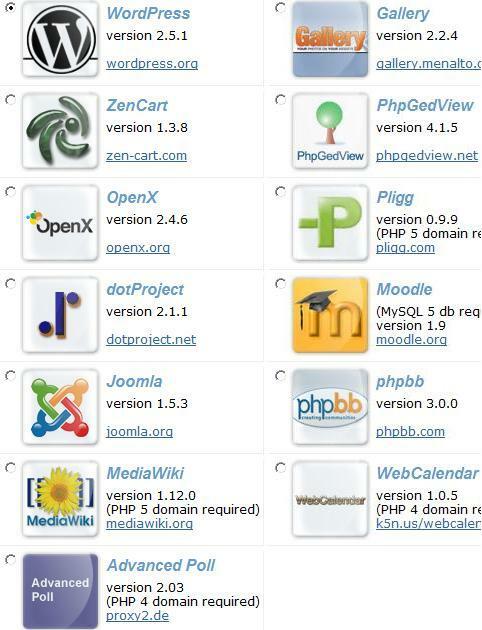 Here are the available software packages that can be used on a Dreamhost account with absolutely no code or technical experience. WordPress – The ideal blogging software for news and SEO experts alike. WordPress allows anyone to write content, include images, and produce pages that are optimized for search engines and your users, too. WordPress incorporates user comments by default and supports more functionality with optional addons. Gallery – Gallery is a fairly straightforward solution to building a picture gallery – online! Templates and optional addons can help you customize the way the software works, without getting too deeply involved in the coding aspects. Zencart – E-commerce solution supporting multiple languages and currencies. You can create a coupon and manage a customer newsletter. Product categories can be as extensive and specific as you like – a powerful open-source solution for some more advanced sales-driven websites. PhpGedView – Want to start a genealogy website? This is what PhpGedView was made for. It allows collaboration with family and filtering from the general public. As new information becomes available, the dynamic scripts allow quick changes to be imported across the entire database. OpenX – Management software for online advertising gurus or just anyone who wants to get the most out of their visitors and ads. OpenX allows you to manage campaigns, set up conditions for ad displays, and basically control who sees what. Dreamhost makes this software available with a quick installation so you can get started with maximum control on revenue streams. DotProject – A free project management software that allows users to collaborate around any type of project. Set up to do lists, submit bug reports, and keep a record of problems, changes, and possible solutions. Moodle – This software is designed with teachers and educators in mind. Moodle allows education professionals to set up online courses, register students into class discussions, and other ways to re-create the classroom on your website server account. Right now, more than 14,000,000 (yes million!) students are enrolled in some class or another with Moodle, so this is a big deal and a powerful tool for education. Joomla – Joomla is an advanced content management system that can be set up like a blog or a newspaper website. There are also a ton of community features and the software could also be incorporated to work with forums and chats. Its a little bit of an advanced project, and sometimes it doesn’t have the streamlined efficiency that WordPress offers. It does offer a huge amount of addons and premium templates, but sometimes these cost a little extra money. phpbb – PHPBB is a great software solution for running forums on your web server. the PHP bulletin board is easily set up and the configuration sections are quite intuitive. A lot of advanced options are available in the program and installed by default. A lot of popular forum websites use this software as it is definitely one of the best free forum solutions around. Web Calendar – The web calendar does exactly what it says. It allows you to create a public calendar of events, or you can create a space for users to create their own calendars. Advanced Poll – Want to set up a polling website? Advanced Poll 2.03 and Dreamhost will have you up and running in no time. Multiple polls, multiple languages, and multiple users give administrators the chance to customize a polling site with depth. Feel free to install any other software or hand-code a website using HTML, CSS, Flash, and/or PHP. These Dreamhost installation packages are just a way for new users to get started quickly with some of the most popular website software on the internet. I had a nice experience with these plug-and-play applications that comes with web hosts today. However i would’ve loved to see vBulletin as the forum platform on Dreamhost and not phpbb. i just not so much of a phpbb fan. I personally use GoDaddy and they also have a one-click installation of a lot of these applications. The problem is that sometimes you have to wait up to 24-48 hours for the applications to install! I know that hosting services like BlueHost offer something like 5 minute installations of WordPress. Regarding ZenCart, I’m curious: has anyone had success with it? I would’ve loved to see vBulletin as the forum platform on Dreamhost and not phpbb. i just not so much of a phpbb fan. Are Pligg Sites Good for SEO?